Product #15661 | SKU BSRN3004X | 0.0 (no ratings yet) Thanks for your rating! The N-3004X Aluminium Tripod from Sirui is a compact tripod that extends to 177 cm, and folds up to only 51 cm thanks to its 180° invertible legs. It weighs 2.18 kg and can hold a maximum load of 18 kg. The N-3004X features a split centre column that is easily converted into a short centre column by unscrewing the hanging hook and removing the bottom of the column. This allows the tripod to reach its minimum height of only 15.5 cm. The tripod also features a detachable leg that transforms into a monopod when you unscrew it from the chassis and attach the mounting plate. You can increase the height of the monopod by attaching the longer section of the split centre column. 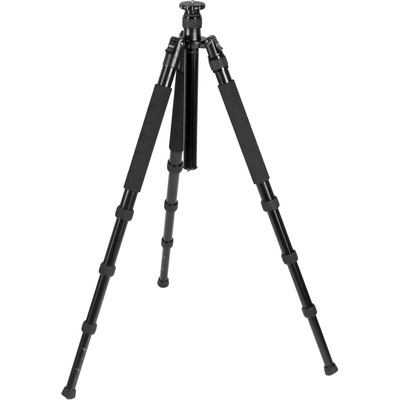 The tripod comes with a padded carrying case, a reversible mounting screw, and two hex keys for tightening the legs. The legs fold up against the tripod rather than down like most conventional tripod legs, keeping the tripod head within the legs and thereby saving space. The centre column is reversible for low angle shots. Twist locks allow quick adjustment of the tripod's height. The tripod legs can lock in three different positions for shooting on uneven terrain. Stainless steel spikes emerge from the rubber feet for extra stability in grass, gravel, and other loose terrain. A foam grip on each of the legs adds comfort in cold weather conditions and helps protect your gear by facilitating a sure grip. A centre column hook allows you to add a ballast for a sturdier setup in windy conditions.